Jack Turner's old professor and mentor invites him to Culpepper to do a lecture series. Almost immediately, he starts experiencing wild dreams that nearly drive him insane. He embarks on a quest to discover what is causing them. Joe Boyd got tired of city life and high crime rates. The town suits him fine with its laid back college community. He gets a nasty surprise when two people end up dead. Rachel Cook's teenage crush morphs into full-blown attraction when Jack comes into town. He confides in her about the dreams, and she's drawn into the web of intrigue. Suspense coupled with romance is always a big hook for me. Dan Walsh fashions a tale that made moves like a high-speed train. I had an inkling how it might end, but it still sent shock waves when it happened. The characters, setting, and storyline were unique and held my interest all the way through. 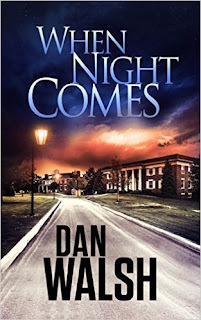 Dan Walsh is another new-to-me author. 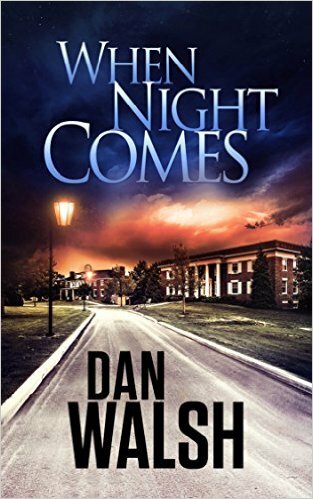 When Night Comes is the first book in The Jack Turner Series. I'm glad I got the Kindle version and sampled his work and look forward to the next installment. I'm giving this book 5 stars. Disclaimer: Neither the author nor the publisher requested a review. All opinions, as always, are mine alone. Writers and Readers: What are your thoughts on fast-paced suspense novels? I enjoy fast paced suspense novels. Wow, it sounds great! I like suspense and romance, too. Thanks for introducing me to another new author, Suze! Susan: Fast paced novels keep me reading. I enjoy one that keeps me wondering what will happen next. Blessings to you and yours. I love suspense. It allows my brain to "unplug" and rest.